Some dishwasher noises are normal. The sloshing of water or the humming of the pump motor are familiar sounds. But if your dishwasher starts making strange sounds or is unusually loud, it’s time to investigate. The type of sound should help you determine the root cause. This can be a normal noise if your dishwasher has an electronic control that has a motor-driven electrical switching device in the panel. 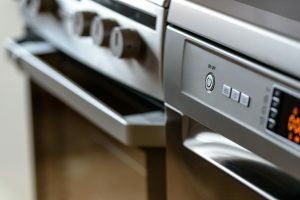 The grinding noise (sometimes it sounds like clicking) is the result of the motor working as the dishwasher changes cycles, and is no cause for concern. However, if this is a new noise, open the dishwasher door mid-cycle, wait for the steam to dissipate, and pull out the bottom rack. Smaller items, such as cutlery or condiment containers, can fall through the rack slits. Check for any such lodged items around the drain impeller (the rotating plastic blades). If the sound continues, shut off the machine and remove the impeller. Look for any debris stuck in the chopper blade area. If you can’t find anything lodged or stuck in the dishwasher, the grinding could be caused by not enough water being sprayed into the machine. Check the water-inlet valve. Another possible cause of the grinding noise could be worn-down motor bearings. a piece of broken glass or hard plastic, if it becomes lodged in the pump intake, can cause a loud buzzing noise. Cleaning out the pump intake will fix this. A humming noise is normal during a regular washing cycle. If this humming is getting louder, and the control panel goes blank, the fan that turns on during the drying cycle is the problem, and will have to be replaced. A high-pitched or loud humming sound could also be a sign that your motor is faulty, requiring replacement. A squealing sound can be the result of dry pump seals. With a new dishwasher, or one that hasn’t been used in a while, the pump seals become dry. Pour one or two quarts of water into the bottom of the dishwasher before you run it to quiet the squealing sound. Worn-out motor bearings can also produce a high-pitched squealing noise, as well as the grinding noise already mentioned. As well, the diaphragm inside the water inlet valve can deteriorate and deform over time, interacting with the water rushing in to produce a loud squealing or buzzing noise. A rattling noise can occur if the dishes, utensils, and other kitchenware are not properly placed in the racks, and they bang together when the dishwasher is running. Run an empty load to determine if improper loading is the cause, and make sure all items are secure in the future. A small piece of glass or other hard object stuck around the chopper blade or the drain pump could also cause a rattling sound. If you’ve already checked for loose dishes in the racks, and for stuck glass, you could have a worn out pump motor or a plumbing problem. If you hear a knocking or thumping sound at regular intervals, it’s most likely caused by the spray arm hitting something inside the dishwasher as it rotates. It tends to happen with larger pots, cutting boards, wooden spoons, and spatulas. Open the dishwasher and rearrange the taller pots, pans, and utensils to provide clearance for the spray arm. A thumping sound could also be caused by the drain line constantly hitting the side of the cabinet or the back wall when the dishwasher is running. Readjust the drain line if it’s the source of the thumping noise. If you hear metal banging sounds when your dishwasher’s running, it’s probably a plumbing issue known as water hammer. This happens when water moves rapidly through pipes and is suddenly stopped when a valve closes quickly. Shock waves are then created that shake and pound the pipes. A plumber can install a water hammer shock arrester on the pipes to prevent this from happening. There are a number of reasons for a dishwasher to start beeping. Depending on your model, you may have to do a little research if the reason isn’t obvious. Opening the dishwasher door before a cycle is complete can cause the dishwasher to beep, indicating the door is still open or unlatched. Close the door, or make sure it’s latched properly, to continue the cycle and stop the beeping. Beeping sounds may indicate problems caused by a power surge. Press the start or reset button for about ten seconds, then wait for two to three minutes to see if the dishwasher starts working again. If this doesn’t work, unplug the machine or switch off the breaker for at least one minute. Then plug it back in or turn the circuit breaker back on to see if this was successful in resetting the dishwasher. If the dishwasher is beeping in combination with blinking lights, this may indicate the anti-flood device has been activated. This means the dishwasher sensors have detected water in the casing, and the machine has stopped to prevent water in the tub from leaking out onto the floor. Sponge up water in the base, and if your dishwasher is freestanding, tilt it slightly to drain out the excess water. Your dishwasher will beep when its reed sensors detect any object blocking the spray arms. Once the blockage is removed, the dishwasher is reset and will resume its normal operation. Adding rinse aid or salt incorrectly to your machine will cause it to beep. Check your manual for proper instructions on how to refill. A faulty pressure switch or flow meter can also cause your dishwasher to beep. Before making any adjustments or repairs to your machine, always consult the manufacturer’s manual, and call in a technician if necessary. Your dishwasher is an important part of your kitchen. To keep it running like new, call C&W Appliance Service at (855) 358-1496 or (214) 358-1496.